“Malcolm Edward and The Disappearing Merry Christmas” from Christian Faith Publishing author Diana Hill is an endearing children’s book complete with colorful illustrations. Perfect for younger audiences, this book teaches children that Christmas is not about the presents under the tree, but the gift of love they receive from their family, and above all, from Christ. “Malcolm Edward and The Disappearing Merry Christmas”: a charming and virtuous children’s book that follows the story of a young boy as he learns what makes Christmas truly special. “Malcolm Edward and The Disappearing Merry Christmas” is the creation of published author, Diana Hill, who resides on a small horse farm in South Carolina, where she spends her time writing and operating a home-office business. Published by Christian Faith Publishing, Diana Hill’s new book tells the story of a boy named Malcom Edward, and how he becomes caught up in the lights, ribbons, surprises, and presents during Christmas, and lets Jesus Christ fade from the celebration. Throughout the whole year, Malcolm spends his time thinking about Christmas presents, and forgets to enjoy every other celebration. He doesn’t realize just how much he is missing out on until Christmas morning arrives and he learns that Christmas isn’t special if he doesn’t have his family surrounding him, and Christ at the center. View a synopsis of “Malcolm Edward and The Disappearing Merry Christmas” on YouTube. Consumers can purchase “Malcolm Edward and The Disappearing Merry Christmas” at traditional brick & mortar bookstores, or online at Amazon.com, Apple iTunes store, Kobo or Barnes and Noble. 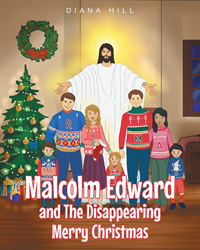 For additional information or inquiries about “Malcolm Edward and The Disappearing Merry Christmas”, contact the Christian Faith Publishing media department at 866-554-0919.